Shepherd Hill quarterback Ryan Wong-Li may need to hit some shots downfield against a tough Wachusett front-seven. Another week, another dynamic matchup for the SuiteSports Game of the Week! This week, 0-2 Shepherd Hill is fighting to keep playoff hopes alive against a 2-0 Wachusett team that defeated its first two opponents a combined 77-19. Hate to call this a must-win for the Rams, but an 0-3 hole may be too much to overcome, especially in their stacked D2 Central alignment. The Mountaineers have two blowout wins under their belt. Despite playing without stud senior linebacker Connor Dubzinski, the defense for Wachusett has definitely showed up to play. They took a quarter to get their traction last week, but recovered smoothly. Offensively, a tough line helps power the strong run game. Junior running back Cole Durkan has shouldered much of the rushing burden so far this season. With a touchdown against Tantasqua week one and tacking on three to that last week against Fitchburg, he is a real threat out of the backfield. Don’t be fooled though. Josh Furtado is just as dangerous behind this dynamite O-Line. The Mountaineers are now looking at a very tough schedule bearing down on them in the weeks to come, including two away games against perennial powerhouses St. John’s and Leominster. This week, Wachusett can make a big statement to the rest of CMass. A third consecutive win would send them on the road in good standing. The Rams have two disappointing losses to opponents that they played very strongly. They were close contenders in both games. They played toe-to-toe with St. John’s until the fourth quarter, where the Pioneers’ deep roster simply had more left in the tank. Shepherd Hill is also still in the midst of its off the field conflict. Mensah v MIAA has become one of the more interesting stories of the year. It appears the MIAA will be waiting for Mensah’s appeal on September 29th, making him yet again ineligible to suit up for the Rams. Frustrating as this may be, they still have the pieces in place to right the ship that’s begun taking on water. Zack Magdis has been a machine so far this year. Ryan Wong-Li is looking more and more comfortable running the offense, and Alec Lindstrom and the O-Line should be ready for a battle against the Mountaineers' front seven. If the Rams can go out and grab this road win it could be a major turning point in the season. 1-2 is a very long way from 0-3, and if Mensah should win his appeal, his return to the field could offer them one more dynamic play maker on the starting roster. Both teams are built to run the rock. Strong offensive lines and running backs are going to grind for much of the scoring in this one. The defenses will most likely be loading the box a little heavily come Friday night. This may lead to some one-on-one coverage on the outside. We may see some shots through the air from both sides in order to spread the defense. Who does a better job locking down the other team’s offense? Both these teams can put up big numbers on the scoreboard, so expect this one to come down to who can slow the opposing offense the most. It’s going to be a good one this Friday night. 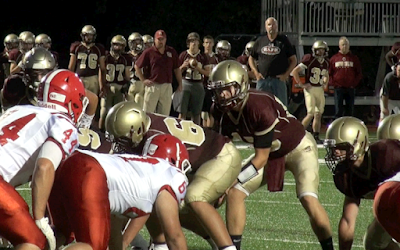 Shepherd Hill will roll into Wachusett in desperate need of a win. They will find one over the Mountaineers, but by no means is a blowout in the forecast. Expect this one to come down to the wire.